The evening glow is glancing off the cypresses and palms that rise up behind Alimento as the plate-glass window frames a bustling street scene. There go a pair of joggers in their washed-out Ivy League T-shirts, and here’s a group of friends ambling down from the basketball court near the neighborhood dog park. Inside, Spoon rocks on the Spotify feed while manager Caitlin Coyne and a waitress in a flannel shirt pick leaves off thyme for the kitchen. A handful of people at the small bar clink glasses of Slovenian rosé before heaping chicken liver crostoni with black plum mostarda onto grilled wedges of country bread. Yeah, later, the crowd descends, and the decibels grow bludgeoningly loud. But for now I feel as if I’m a regular in some joint around the corner, even though I’ve crawled through 30 minutes of traffic to get to this sliver of Silver Lake from Mid City. Zach Pollack’s new spot can have it both ways: It’s laid-back enough to be a neighborhood stash where charging $1.50 per person for filtered water goes toward preserving a local landmark, the Silver Lake Reservoir. But it’s also good enough to be a destination restaurant like Sotto, which Pollack and Steve Samson opened near Century City in 2011. There the focus is on purist renditions of peasanty dishes from Italy’s south, eschewing cream, prosciutto, such hard grana cheeses as Parmigiano Reggiano, and other luxuries from the north. At Alimento (“nourishment” in Italian), the entire boot of Italy is on Pollack’s compass. The bollito misto, a classic from Emilia-Romagna, brings together boiled tongue and brisket orbited by satellites of horseradish, preserved quince, and a porridge of bone marrow and bread crumbs. Dusted with mullet roe bottarga, vinegar-marinated mackerel resting on delicious cold shell beans draws a bead on Puglia. The bagna càuda breezes in from the Piedmont region in an earthenware bowl, a flame flickering beneath the buttery dipping sauce of thrice-blanched garlic. And while the roasted vegetables beside it already have ample richness from the olive oil they’re cooked with, raw radish and bell peppers etch a line of crisp acidity that juts through the dip’s lushness. Ever on the lookout for the highest-quality ingredients, Pollack favors Pasadena’s Grist & Toll, whose artisanal stone mill provides the flours that allow him to work at the most authentic level. There’s a fantastic tensile aspect to the whole wheat bigoli—“one of the few extruded pastas of the Veneto,” the chef told me over the phone. Spring-shaped radiatori, black with squid ink, glisten in a reduced sauce of mussels, dried tomatoes, and red wine-braised squid. Bathed in veal ragù bianco, a tangle of rye tagliatelle reframes a grain I think of in terms of a deli loaf, though a heavy hand with the lemon zest occludes the meatiness of the porcini. 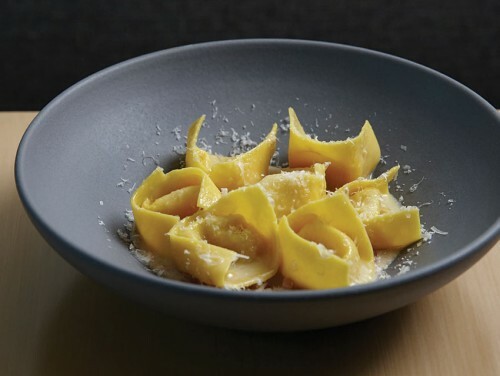 Pollack even ups the degree of difficulty in making the famously challenging Bolognese standard, tortellini in brodo (in his memoir, Heat, Bill Buford claims that you need an “elfin girl’s” fingers for the task). Rather than serve them the usual way, bobbing in broth, he puts the liquid inside so it splashes across your palate with a tap of the tongue, a xialongbao dumpling at one remove. Despite the respect for culinary tradition that Pollack demonstrates at every turn, he is more than willing to do away with received wisdom. For instance, he dismisses the idea of al dente as a requirement for quality, noting how those silky tortellini succeed because they’re pliant and soft. Though I love good olive oil drizzled across a plate of vine-ripened heirlooms as much as the next person, I admire that the chef has scant tomato dishes on the menu; sliced in tricolore salads and chopped as a concassé garnish, tomatoes have become shorthand for generic Italian. Instead of a random addition, Pollack embeds a slow-roasted handful into a farro salad underpinned with ribbons of broccoli, diced cucumber, and chunks of young pecorino from the south. At Sotto that’s an ingredient representing strict regionality; Pollack untethers himself from such restraint at Alimento, utilizing the versatility of cheese. Since the massive aged granas hail from way north of Rome, they don’t make it onto the menu at Sotto. I don’t miss them there, where the ragusano and podda accentuate the sirocco of herbs that envelops the restaurant. At Alimento I’m only grateful for what Pollack achieves with them. Shaved in big flakes, Parmigiano is sufficiently assertive to tame the sharpness of roasted escarole heart dressed with salt-packed anchovy vinaigrette. The Sardinian variety of ewe’s milk pecorino, fiore sardo, puts undeniable muscle into a bright salad of fennel, mint leaves, and sizzling lamb belly morsels. No dairy is involved, but there is that same delight in setting bold flavors against one another in the pesto trapanese, whose ground almonds—somehow so much earthier than pine nuts—add a base note to the Calabrian chiles atop the grilled orata. To encourage a more social vibe, Pollack has built much of the menu around big, shareable dishes served on olive-wood platters that look like cross-sectioned tree trunks. Never mind that solo diners can’t partake, rendering a third of the menu off-limits to them. The planks have another drawback: Impressively ringed with roasted potatoes and piled with caraway seed-flecked savoy cabbage, the massive bone-in pork shank has barely been set down on the table before brown sauce is cresting the brim and pooling on the table. Instead of communicating anything merry, the presentation seems not fully thought through. Maybe that’s a picky point, but the strength of Pollack’s cooking is in its quiet intelligence and unflashy precision. Thirty years old and a native of West L.A., the chef fell for Italian food as a teen, when he would order the penne pomodoro at Caffé Delfini on Channel Road in Santa Monica. As an architecture student at Brown, he spent a semester abroad in Florence, his fascination with Brunelleschi gradually receding as one for cucina grew. He did a stint at Ristorante Ambasciata, near Modena, which Pollack honors with cotechino,a pork sausage that he presents below a drift of streusel, the sweetness of the accompanying zabaglione traced to a white Lambrusco reduction. Pollack met Samson during a summer stint at Neal Fraser’s Grace, and soon the two were heading up David Myers’s Pizzeria Ortica in Orange County. Within two years, in 2011, they were in the open kitchen at Sotto, leading their crew through clouds of pasta steam as they draped billowing pizzas with guanciale and ricotta. Now Pollack is more likely to be found working the line at Alimento in a white T-shirt, surrounded by cooks in bandannas, a blurred symbol of the trajectory of Italian food in Los Angeles. We’ve pushed through the meatball-and-checkered-tablecloth years, recovered from a Cal-Italian infatuation, and reached a level of knowledge that breaks with the recent past even as it embraces heritage at a deeply respectful level. Chefs such as Pollack and Samson (Bestia’s Ori Menashe, Mozza’s Matt Molina and Chad Colby, Bucato’s Evan Funke, too) are working at the source, where an adherence to modest principles of flavor-enhancing patience and thrift is the norm. Pollack’s chicken liver crostoni came about because he wanted to use what was left behind from the seared cubes he deglazes with marsala and folds into spears of maccheroncini pasta. He may have inherited a bells-and-whistles Rational oven from the long-delayed restaurant that was supposed to open at the site, but a bowl of his farro and white marrow bean zuppa tastes as if it came directly from a pot simmered in the family hearth. Alimento is a serious restaurant, which is not to say it’s self-important; Pollack leaves himself room to depart from the canon, even to thumb his nose at it, however subtly. Labeling the bagna càuda with “DOP”—the Italian designation for regional purity—is a sly commentary on the protected designation of the Neapolitan pizza. Sure, you’ll find a juicy Giornata Barbera from Paso Robles and delicate pours from the Alto Adige on the short list, but Grüner is on tap, too, as if it were the restaurant’s session beer. The Italian American salad is described as being “improved,” and rather than having chickpeas rolling around “aimlessly,” as Pollack puts it, he makes them earn their place: Pureed and spread beneath chopped radicchio, Little Gem leaves, and salami, they act as a dressing. He adds matchsticks of fried chickpea flour as well to counter the kick of house-pickled pepperoncini. His most off-the-wall creation, Pig in a Blanket, is a spelt flour puff pastry erected with a slab of mortadella, turnip kraut, mustard seed, and oozing stracchino cheese. If this were Langer’s, the thing would merit its own iconic number. Perhaps the XIX. Pollack also knows when less is best. While the hazelnut croccantino isn’t the fanciest dessert in the world, its simplicity is just right. With bits of skin-on hazelnuts scattered over condensed milk rice pudding, the torrefied caramel notes pierce the dessert’s richness. Scooped into a glass jar, this treat has the spirit of a gelato cone. After my last bite, I take one final look around at the roomful of people. It’s loud all right, but this is Silver Lake—flannel and seersucker, Priuses and old diesel Benzes. I’m minutes from downtown yet distant enough to smell fig trees and jasmine in the night. Next articleWho Killed Bugsy Siegel?